Carpet flooring in Twin Falls, Idaho, is easier to find when you visit our full-service showroom. When you are planning your remodeling project, new flooring can make all the difference in leaving a great impression--as well as improving property values. Count on us to help you fashion a cozy and timeless ambience to your interior. New carpeting is an investment that will serve you, your family, and guests well for years to come. Get the cozy, comfortable, and classic carpet you desire from a business you can trust. We set ourselves apart from other carpet stores in the area by carrying the largest selection of high-end carpets. With so many different types of carpet to choose from, you are sure to find an option that satisfies in both style and price. Since opening the doors of our showroom, we have continued to earn a reputation for our impressive selection and exceptional services. From initial shopping to successful installation, our team continues to provide professional guidance every step of the way until your flooring replacement project is complete. With our vast wealth of knowledge and selection of high-grade carpeting, you have everything you need to plan and execute the ideal remodeling project. Carpet has been widely regarded as a staple for the “welcoming home.” Its texture, color variety, and wide array of weave types allow property owners a vast array of options to create a unique interior. The soft feeling underfoot and ability to impart a “warming” atmosphere are popular traits of carpeting. With advances in manufacturing technology, these carpets are also easier to clean. Many of our carpet products incorporate stain-resistant properties, ensuring the vibrant colors remain through everyday use. Hands down, carpet is a great addition to the family-oriented household. Is your home an active place? Try Berber carpet for your next interior remodeling project. Characterized by fibers that are looped and left uncut, Berber has gained popularity for its distinct appearance. The “pile” height for the fibers can range from low and tight to high and luxurious. As such, it has innate soil-hiding capabilities. 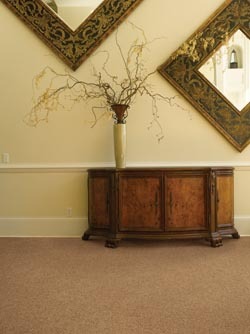 Enhance your high-traffic rooms with Berber carpet and leave a lasting impression on guests. Upgrade the value and appeal of your home with floors from our carpet store that showcase any room. Invest in new and improved carpet and get the long-lasting results you desire. Rely on our flooring specialists to deliver superior carpet options at the most reasonable prices. We offer a number of different carpets at a range of price points, ensuring you have a spectacular choice of the most stylish options. Choosing the right carpet is simpler when you visit our location. Our sales representatives work hard to ensure you find the right products to fit your specific needs. We stay up-to-date with the latest advancements in the carpet flooring industry so you are fully informed of your options. As a result, you pick products that accommodate your design sensibilities, while also ensuring the lasting strength and value of your property. When you visit our center, the flooring experience is tailored to your specific sensibilities. The associates on staff at our flooring store take the time to understand your expectations, making it easy to identify the flooring of your dreams. We make helpful recommendations that effectively narrow down the vast collection of samples to a few options most likely to satisfy. In addition to regular carpets we also offer a variety of reasonably-priced area rugs. Our showroom is affiliated with a well-known national franchise. We leverage our extensive buying power and support network to serve as your source for flooring. Each member of our team is specially trained in flooring. Simply put, we act as your interior design assistant. We make it easier to create a new interior that will serve you well. Not only do we serve the flooring needs of homeowners, but we also assist many local businesses with their flooring needs. We carry commercial carpet designed to provide any commercial location with a much-needed update. Whether your old carpet is worn down by heavy foot traffic or unexpected damage, we have you covered. It is essential that you choose commercial floors for a commercial space. As business properties typically experience more wear and tear than the average home, they require floors of a higher grade. With durable new carpeting from our location, you can feel confident that the floors will continue to look great and hold up far into the future. Guarantee the long-lasting performance of your new floors by entrusting carpet installation to the experienced technicians. Getting the carpet you’ve always wanted means investing in a quality product along with accurate placement. This is why our installers utilize the most trusted techniques and tools to lay new carpeting. When you shop at our showroom, you can always expect fair, sensible rates for our carpet installation services. We make a point to deliver a complete and pleasant experience. Many of our products are eligible for our warranty and guarantee programs. If you choose one of our 4-Star or 5-Star rated carpets, your purchase may qualify for the Confidence Plus Warranty. According to this warranty, if you’re not satisfied with your floors after 30 days, we’ll replace them with a comparable product free of charge. This means we’ll even pay for the labor. Contact us and discover the carpet flooring available at our local showroom. We are proud to provide carpeting for Twin Falls, Mountain Home, Chalice, Sun Valley, and Stanley, Idaho, as well as the nearby communities.